Fresh oranges fill a huge crate at my little tienda. Not an orange crate I am used to seeing in Canada. You know the kind. The oranges are packed perfectly. Tissue paper wraps and protects each one. This orange crate spills over the sides, not only with oranges, but with the stems and leaves still on and still fresh. Just picked oranges. Oranges that give off such a sweet fragrance when touched to my nose, I may swoon. A huge palm leaf basket sits close by. Filled with fresh strawberries, ready to be plucked from their resting place and eaten. Long succulent green beans spill over into the shelf from the brown bag in which they are stored, and beautiful brown mushrooms wait to be taken home for comida. I adore this time of year. I live on fresh orange juice, squeezed in Mexican juicer, snack on juicy strawberries and include beautifully fresh picked vegetables in quick sir fries. It's an abundant time of year. One has to be quick when buying the fresh produce. By tomorrow afternoon there will not be much left, and we will be waiting for the next truck from the ranchos. Managed to make a card. Not much happening in the studio though. It all sounds and looks great. 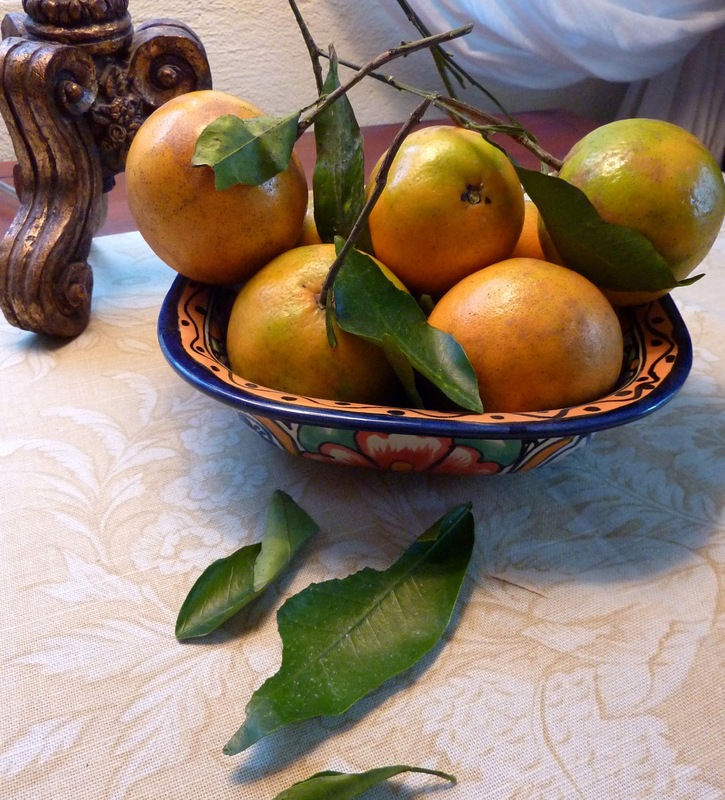 We will have fresh oranges soon and they taste so good too. I love this time of year for the cooler weather...best time ever now for about five to six months. Valerie took the words right out of my mouth. YUM! Fruits and veggies direct from the vine always taste the best! Thanks for the photos. Goodness me Donna you tease ! I am salivating at the thought of your feast sounds magnificent. Here in thessaloniki the trees will soon be filled with oranges and I love this time of year. The kids have orange fights on their way home from school with the fallen oranges !! Beautiful fruits...you should paint them!